If you've struggled to keep your fat intake in check, good news: The latest buzzworthy diet says it's the quality of fat you eat, not the quantity, that matters. And, yes, you're supposed to put fat in your coffee. If you've ever struggled to keep your fat intake in check, good news: The latest buzzworthy diet says it's the quality of fat you eat, not the quantity. And in fact, more fat is good, even saturated fat. Sound crazy? The eating philosophy is outlined in the book The Bulletproof Diet ($16, amazon.com), and itâs gaining some traction. The title recently hit bestsellers lists in both The New York Times and Publishers Weekly,Â and at least one celeb (Divergent star Shailene Woodley) swears by one of the diet's methods, Bulletproof Coffee (more on that in a minute). The main thrust of the diet is that eating the "right" foods can keep you lean, muscular, and energetic, plus help ward off disease and improve your mental sharpness. Dave Asprey, the book's author and creator of the diet, is a Silicon Valley entrepreneur who was formerly overweight ("At my heaviest, I was 300 pounds," he tells Health). Asprey says he spent 15 years talking with health and nutrition experts, reading books and studies, and experimenting on his own body to come up with the plan. The main idea behind the Bulletproof Diet is to get 50 to 60% of your daily calories from healthy fats (such as coconut oil, avocado, and grass-fed and/or pastured animals), 20% from protein, and the remaining 20 to 30% from vegetables. Grains and legumes are to be avoided when eating Bulletproof. Also off the table are pasteurized dairy, industrially raised meats, sodas and juices, farmed seafood, dried fruit, and anything fried or cooked in a microwave. The diet bears some resemblance to the Paleo Diet, but Asprey says it's much more focused on the purity of ingredients and awareness of how cooking affects various foods. For example, on the Bulletproof web site, it says: "If you canât find grass-fed meat, choose the leanest cuts of grain-fed meat possible. If you can find grass-fed meat, choose the fattiest cuts possible." Why? "Industrial animals have omega 6 fats and accumulated toxins in their fat from feed," Asprey says. "Grass-fed animals have omega 3 healthy fats and low toxins." So what are some typical Bulletproof meals? Here are a few ideas. Bacon and eggs (both from pastured animals) or an omelet with lots of vegetables. Or, "Try smoked salmon, avocado, and chopped vegetables," Asprey says. "My kids eat that and they love that for breakfast." Here's one of my creations: Pastured eggs fried in organic red palm oil topped with sliced avocado. "The easiest thing for lunch is this. Take your favorite vegetables, steam them, and then throw them in a blender with some healthy fatâmacadamia nuts or butterâand some spices, and you have a delicious, creamy soup," Asprey says. "Itâs a very fast lunch and incredibly satisfying and nourishing." 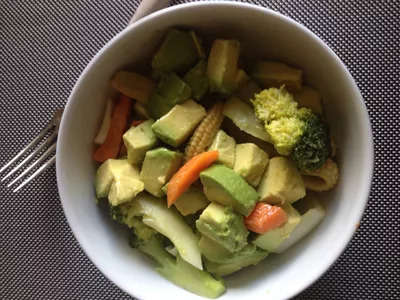 Another idea for lunch: Warm leftover steamed vegetables in a skillet with grass-fed butter and mix with a chopped avocado, like I did. "A typical dinner plate would be 3/4 veggies, 1/4 healthy protein, and a just a touch of carbs, like butternut squash or carrots, or we might have fruit after dinner," Asprey recently told Well+Good. "Then thereâs a fat source on all of that, like grass-fed unsalted butter or guacamole." This is a combination of brewed coffee made from special beans (Asprey says the kind he sells are higher quality and lower in toxins than other brands) mixed with 1-2 tablespoons unsalted, grass-fed butter (such as Kerrygold) and 1-2 tablespoons of a special coconut oil extract called Brain Octane, which Asprey also sells. 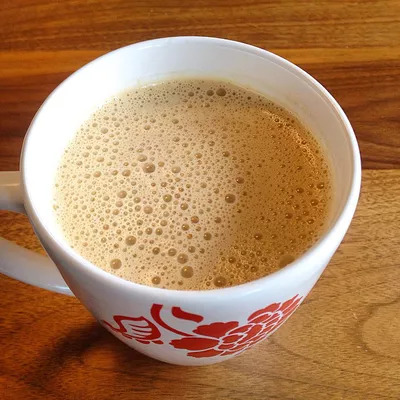 You mix the coffee, butter, and oil in a blender until itâs frothy, then drink. He claims this brew will stop hunger for several hours and improve mental focus. It will look something like this. "Stop looking at fat as fattening and look at it as nourishment for your body," he says. "Be extra choosy about the kinds of fat that you eat, that's really important. Butter, coconut oil, avocados, meat from healthy animalsâthose are your best bets. All of your hormones are made out of saturated fat. You will have much less stability in your hormones if your body is starved for saturated fat." "Fruits are not vegetables," Asprey says. "Bananas, oranges, and grapesâthose are especially sugary. Replace that fruit with vegetables or lower-sugar fruit. Have a cupful of blueberries instead of an orange." "Movement is really good for you, but once a week, focus on intense exercise, either doing fast intervals or lifting something heavy," he says. "Donât be afraid to sweat a little. You get enormous benefits." "The Bulletproof Diet is not about being perfect," he says. "It is about choosing foods that are going to make you feel and look the best from the foods that are available to you."